Video lesson: "The Bossa-Jazz-funk from A to Z"
The two drumset methods written by Marc De Douvan, one for beginner and intermediate level, one for advanced level, in book format, available here. They address all styles. 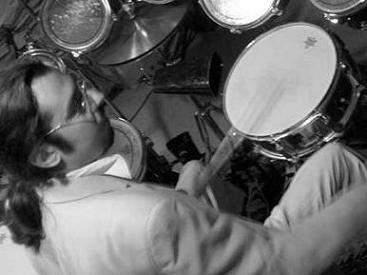 You will find the best techniques of the best virtuoso drummers, an original approach to improvisation and learning based on mathematics, for a perfect and effective progressiveness and also original phrases and compositions. This section brings together traditional polyrhythms with a historical text and interactive audio clips. Listen, for example, a samba with 15 voices with the choice of the instruments that you want to hear! NEW! Discover the individual drum courses offered by Marc De Douvan in videoconference, wherever you are in the world, via Skype.
. : : On the front page : : . New video of an improvised drum set solo by Marc De Douvan in Afro-Cuban style (with left foot clave and right foot tumbao in independence) recorded and filmed the October 19, 2016. "The Bossa-Jazz-funk from A to Z"
Original interactive progressive lesson extracted from the two drumset methods of Marc De Douvan. the publication of the translation in English of the GREAT DRUMMERS pages is done now! The translation of the free online lessons ended today with the lesson "Conceiving your drum set", which is perhaps unique in its genre in the world wide web (lesson augmented today, with 10 examples of sets in subjective view, set up and photographed by myself, a precise description of the elements, and stylistic, technical (practical interest of each placing and element) and historical explanations, including the description of forty original sets of famous drummers of all periods and styles, with sometimes original instruments designed especially for them and by them and sometimes sold in stores). New private lessons by video conference with Marc De Douvan via Skype are available here. The translation in English of the "Percussions" pages (about Mandingo, Brazilian and Afro-Cuban traditional percussions) with an original technical and historical description, with photos of instruments and gestures, basic lessons, audio demos played by Marc De Douvan and interactive polyrhythms (multitrack animations), and also some additions, is finished here! The translation in English of "drumset instruments" with an original technical and historical description and some additions (such as "sounds") is finished here. The translation in English of the French version of this website will be made progressively (day after day). Thank you for your comprehension and patience. You can contact me through my personal E-mail for any question, correction or suggestion.